March 5th at the Building Imagination Center. Funded by a grant from the CSU Entertainment Industry Initiative, the CSU Stanislaus Art Department is hosting a series of guest workshops for CSU Art Majors around the theme of storytelling in the digital arts. Eric Carter is a Bay Area designer and photographer. He has developed and designed eLearning applications, websites and print, illustrations, animations, interactive Flash widgets and portrait photography. Eric is currently working with the Bay Area Video Coalition and Tesla. This series of workshops will conclude with a public exhibition of student work in the CSU Stanislaus’ Building Imagination Center. Limited to Stanislaus State students only. March 18th at the Building Imagination Center. Funded by a grant from the CSU Entertainment Industry Initiative, the CSU Stanislaus Art Department is hosting a series of guest workshops for CSU Art Majors around the theme of storytelling in the digital arts. This workshop will include a brief artist’s talk, an overview of contemporary independent/experimental comics, and a hands-on crash course in comic-making basics. There will be drawing, but no experience is necessary. Kate Rhoades is an Oakland-based artist. 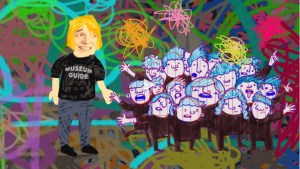 Influenced by a background in comic books and YouTube videos, Rhoades uses paint, publications, and digital media to probe the absurdity of the art world in all its social and institutional facets. She received a BFA from the Columbus College of Art and Design and an MFA from Mills College. March 25th at the Building Imagination Center. Maria Judice is a visual storyteller working within cinema, photography, tech and digital content. She received her MFA from CALARTS in Film/Video. She received the Adrienne Shelly Award for excellence in directing. Director awards were garnered for her films Palm Trees… and moonless. Palm Trees… aired on BET’s Lens on Talent. As a Creative Producer, she works within photography, film, web TV, art curation and gaming. Her mission is to help underrepresented artists bring their stories to the world. April 8th at the Building Imagination Center. 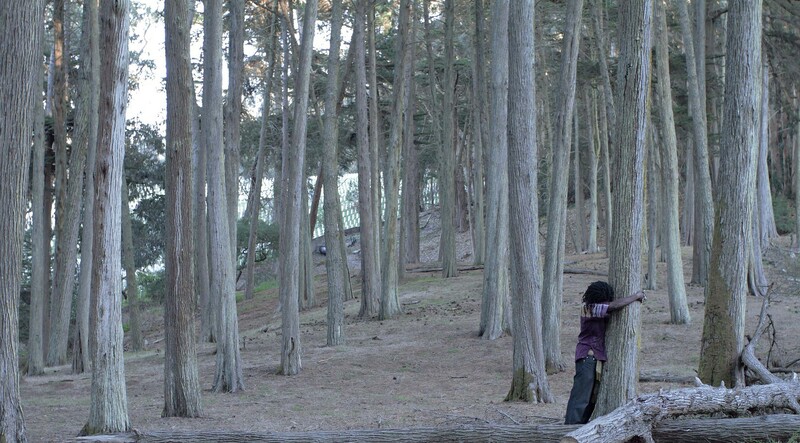 Christy Chan is an interdisciplinary artist and filmmaker based in Oakland, California. She uses video art, installation, and performance to examine the American mythologies of home, belonging and social harmony. Her independent film project “Pen Pals” is inspired by her childhood experience exchanging letters with the Ku Klux Klan on behalf of her immigrant family. Chan holds an M.A. in Communications from Virginia Commonwealth University and was a recent Artist-in-Residence at Montalvo Art Center and Project 387. Her work has been exhibited at galleries, film festivals and public venues including Southern Exposure, Root Division, Kala Art Institute, National Public Radio, the Los Angeles Film Festival’s Shorts Series, the Moth and more. Oct 16. On campus at the Digital Media Center. Funded by a grant from the CSU Entertainment Industry Initiative, the Art Department is hosting a series of guest workshops around the theme of storytelling in the digital arts. The Documentary Video Storytelling workshop will be led by Sheila Ganz, and will consist of five-hours of hands-on instruction in which CSU students develop an idea in a digital medium. This series of workshops will conclude with a public exhibition of student work in the CSU Stanislaus’ Building Imagination Center, and select students will travel to the CSU Media Arts Festival. The 2015 CSU Media Arts Festival will be held on Saturday, November 7, 2015 at CSU Los Angeles! This 25thAnniversary of the MAF will feature a full day of interaction with media faculty and media and entertainment industry professionals, screenings, and an awards ceremony. Journey to the future of Modesto, California with one of the players of a transmedia alternate reality game. 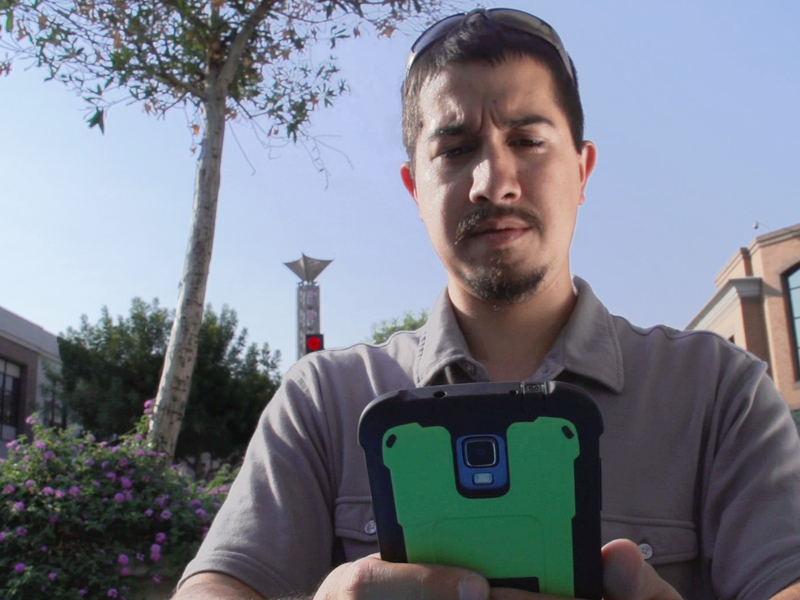 This documentary of a choose-your-adventure style game leads our player throughout downtown Modesto, California, as he creates his own path through the story line, trying to find his estranged brother. Uncovering clues and reflecting upon what the future of the city could be, our player explores his own moral character as he exposes or protects his brother from the Enforcers. This video is based upon a real location based choose-your-adventure style alternate reality game set in the year 2034. During gameplay, our player uncovers actual clues located throughout downtown. Each clue reveals the next section of the story, told through video, animations, phone messages, and event pamphlets. Participants earn virtual rewards through location specific challenges. 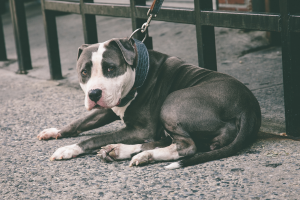 These challenges center around Modesto’s quality of life issues that could be addressed in the near future, such as the creation of green spaces, support for locally owned businesses, and easier access to the transportation center in downtown. 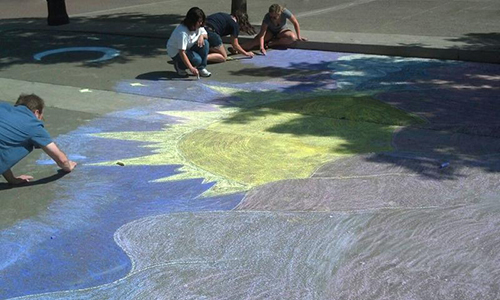 The game play session was coordinated with the 2014 Modesto International Architecture festival. You can play the game here: Modesto 2034: Augmented Reality Game. *Project link will work on smartphones, or Chrome. 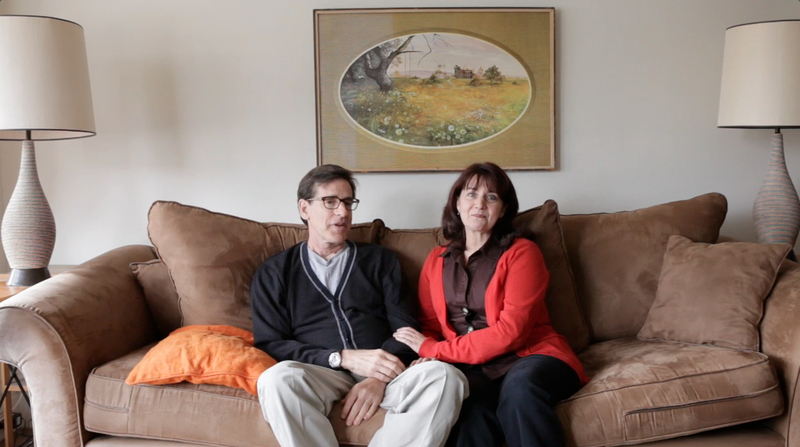 Watch the movie – Modesto 2034: Glimpses of the Future. On the heels of its inaugural faculty exhibition, the new CSU Stanislaus Art Space on Main in downtown Turlock is currently featuring works by 42 alumni from the Department of Art. The exhibition “Art Alumni on Main” opened in the recently renovated space with a November reception that brought together alumni artists, faculty, current students and the community. DeCocker also said the exhibition provides opportunities for current students to connect with alumni and learn about the types of work that they are doing post-graduation. “This is a great show because you will see such a diverse group of artists,” said Ellen Roehne, a Modesto artist and lecturer in the CSU Stanislaus Department of Art. She encouraged students in her art appreciation class to attend the reception and interview the alumni artists. 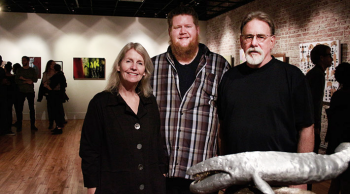 Art alumni Cliff H. and Ann W. Bailey, both from the class of ’73, with their son Clifford W. Bailey, ’10. All three have artwork on exhibit in “Art Alumni on Main. The exhibition is also multi-generational, with alumni whose children followed their footsteps into art at CSU Stanislaus and are now exhibiting together in this group show. Clifford W. Bailey, ’10, who followed the example of his parents, Cliff H. and Ann W. Bailey, both from the class of ’73, are exhibiting very different works of art that include techniques in sculpture, mixed media and photography. Another family exhibiting together includes Larry DeTomasi, ’11, who teaches art at Pitman High School, and his daughter Jessica DeTomasi, ’14. For recent grads, the exhibition is also an opportunity to cut their teeth in a professional gallery environment. Diana Isho, who graduated with her Bachelor of Fine Arts in 2012 and is currently teaching art in Modesto while pursuing her teaching credential, said the exhibition has provided her a chance to grow professionally as an artist and to showcase her work for her students. “Art Alumni on Main” runs through Jan. 16. Located at 135 W. Main Street, Art Space on Main is open to the public from noon to 5 p.m. Monday through Wednesday and from noon to 9 p.m. Thursday through Saturday. 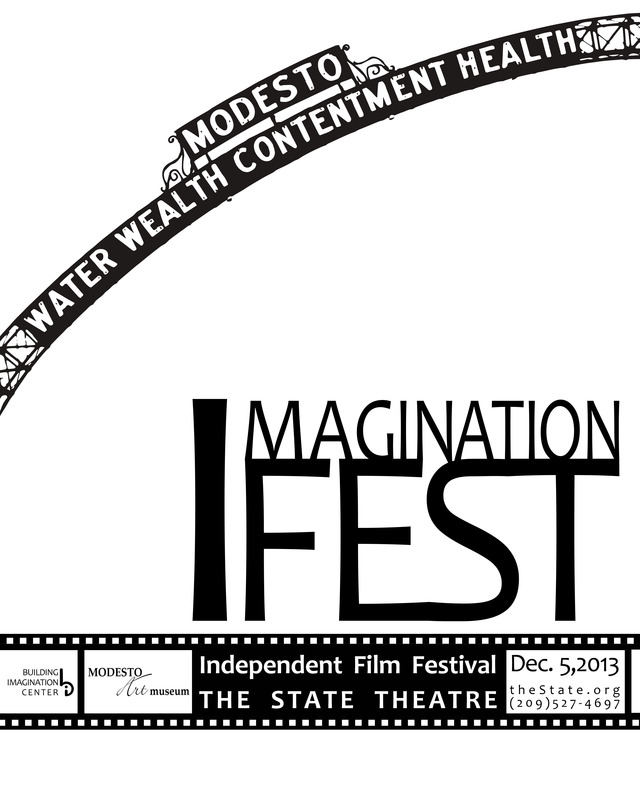 A student created documentary on the Modesto International Architecture Festival and James Broughton’s art-house film The Bed shows the wide range of locally based movies that was part of the Building Imagination Center’s Imagination Film Festival, Thursday, December 5, 2013, at the State Theatre. This was the first film festival hosted by the Center since it became the resident movie makers at the State. Other films screened at the free festival on December 5th included an intimate account of homelessness in Outside the Picket Fence, by local filmmaker Christian Hali. Aspire, a short film by local filmmaker Brittney Miller is a look into the Aspire School system’s approach to learning. Samsara, directed by Nicole Zvarik and Bill Wolter, and filmed by local CSU Stanislaus film students, examines alternatives to mainstream consumerism. 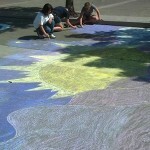 Over 20 participants came out and made chalk art on the sidewalk by the Building Imagination Center in downtown Modesto! What a great way to bring art out into the community. Recently, the City initiated an effort in conjunction with the Downtown Improvement District, Chamber of Commerce, and Convention and Visitor’s Bureau to improve the sociability of our downtown. Due to the Center’s interest in creative placemaking in our downtown, we were invited to be part of the Promotions Group. The Promotions Group focuses on marketing, special events, and public relations for the downtown area, focusing on making it look more inviting and appealing to the local citizens. While we have been contributing to the ongoing research about how the public uses the downtown area, we have also played a key part in the first transformation project. 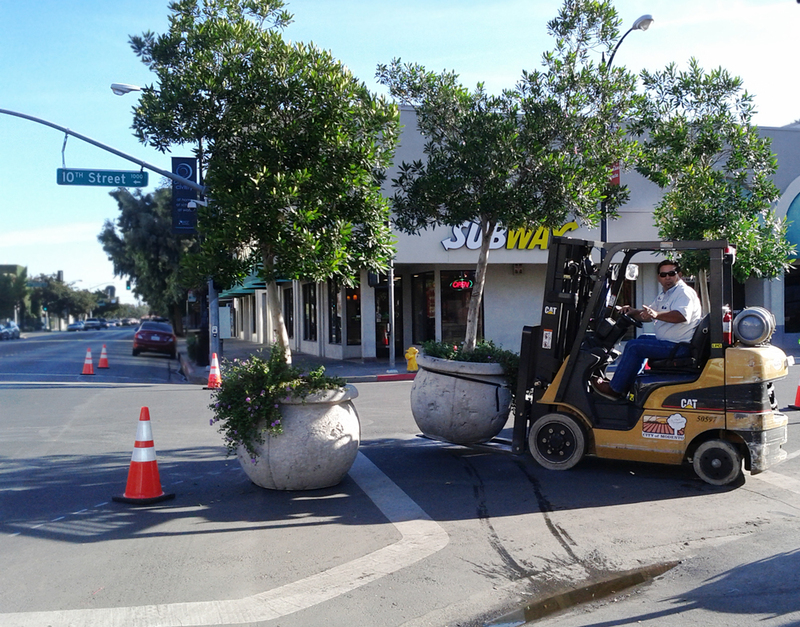 Right outside of our windows, we can see the City taking its first steps towards re-imagining downtown Modesto by converting non-usable street corners into pedestrian friendly ‘parklets’. These are small urban parks created to provide a public place for citizens to relax and enjoy the atmosphere of the city around them. Through the redistribution of city owned tree and flower planters, the addition of some decoupage painting techniques, and cafe tables and chairs, the city has in one weekend transformed the urban experience of 10th and J street. 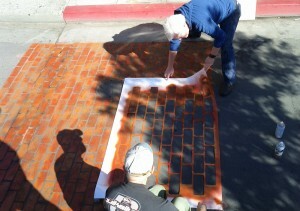 The transformation was covered in two Modesto Bee articles, here and here. And the Building Imagination Center was right there to help. Come out, enjoy a sandwich, and enjoy this transformation firsthand. The City redistributes it’s tree and flower planters to define the borders of the new parklets. Using decoupage painting techniques to help redefine the use of the space. 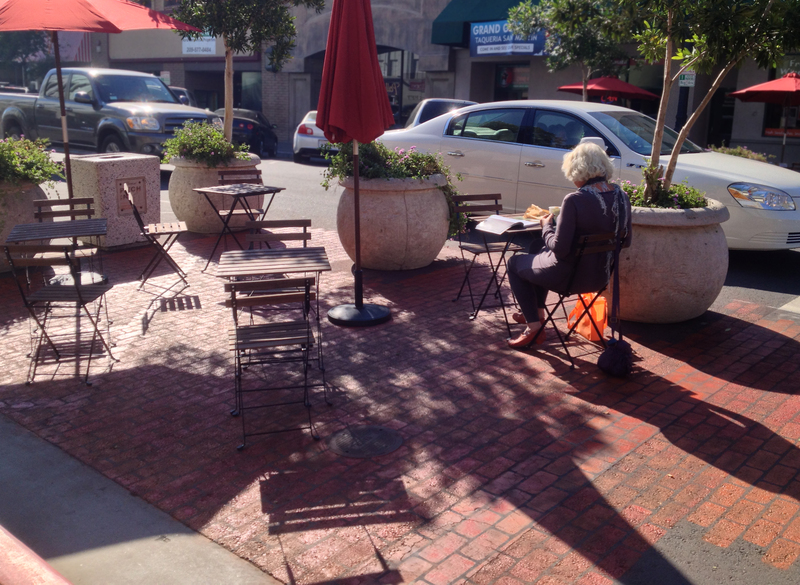 Bistro tables and chairs welcome pedestrians to stop and sit.